When I saw the Star Wars: Jedi Training Academy at Disneyland last year, my first thought was, "this is so cool. I bet you could recreate this experience at home for an amazing birthday party theme." (I never claimed to be normal.) 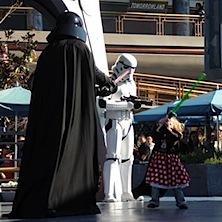 If you haven't seen it, Disney's Jedi Training Academy lets kids learn light saber moves and battle Darth Vader. It's pretty freaking cool, and I figured if you cut out some of the stage craft (like the fog machine) you could fairly simply recreate the Jedi Training Academy experience at home for the most amazing birthday party idea a mini Star Wars geek could imagine. Check out how I did it and how you can too. Even though this party made a huge impression on the kids (they were talking about it for weeks afterward), it was actually a pretty easy party to throw. 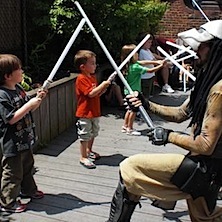 If you have a Star Wars enthusiast at home, you can definitely make his birthday spectacular with a Star Wars Jedi Training Academy Party. Character Actors: The first thing you need to do is figure out who will play your characters. In the Disney version, they have Jedis plus Darth Vader and Darth Maul, but you can do what you like. You could do this with just one Jedi or you can pick different characters, depending on your child's favorites. If you have a game adult in your family or circle of friends, they can certainly play the roles, you can also put an ad on craigslist and see if some out of work actors might be willing (I did this and did get responses). Or, if you want to go pro, call the guys at NY Jedi, a group of Star Wars fans who get together regularly to practice saber fighting. They will come dressed in their own costumes and run the party for you. Costumes: If you are doing it yourself, you can buy adult costumes online. An inexpensive Adult Darth Vader or Adult Jedi Costume will run you about $35 each. Activities: Our Jedi led the kids in some training activities to teach them some cool light saber moves and the kids practiced the moves against each other and against the adult characters. The Jedi also had the kids play some simple saber games like running and clashing sabers and relay races using the sabers as the baton. 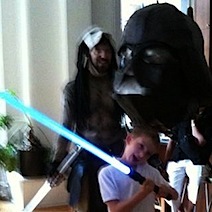 Then we did a Darth Vader Piñata which you can get from the party store or online. Don't forget to get a copy of the Star Wars theme song to play while the kids are battling. Cake: There are lots of complicated Star Wars birthday cakes that you can make or buy, but we did a basic sheet cake and put some Star Wars figurines on top to decorate it. Location: Of course, in NYC, you're wondering where you are going to have this party. Since the kids need a little bit of room to move around, you can hold it in a park during good weather or rent out the gym at your neighborhood YMCA. For more great party ideas, see our NYC Birthday Party Guide.